*The Hi-Def Soul Searcher 3000 (third generation) Vex (means nothing just added some “pishaw!”). Seeing how scared Dwyane Wade was every time Kobe Bryant approached him. Derek Fisher’s insatiable desire to have a slice of pizza the entire game. LeBron seeing himself dressed as Captain America whenever he dunks. What really happened in that hotel room in Colorado in 2003. The only setback was two Gogglometers exploding while trying to dissect Metta World Peace. However, the experiment was a resounding success. Fans felt closer to the game, almost “ghost-like… a higher being,” according to Stan Perkins, who rubbed his mustache giggling before driving off in his windowless van. Sports commentators are very excited to find out how this changes the debate world. Now analysts can confirm which players lack “heart” and are “not all there” in ways never before seen. Who is clutch? Who let his team down? What did he do last night at that night club? Who’s biggest in the shower? Essential questions. Now with answers. Sony is currently developing new systems to use the cameras with scripted dramas and sitcoms; it will have two modes allowing soul searching of the actor or the character being portrayed. It is still struggling with “really good actors” such as Dexter’s Michael C Hall and Real Housewives of Atlanta’s Kandi Burruss. Amazing defense by LeBron! Why is he thinking about water? NO HEART! The NBA Players Union pulled a fast one by sending only Boston Celtics center Kevin Garnett and Los Angeles Lakers forward Metta World Peace into the lockout meeting today with the owners. Derek Fisher et all arrived normally at the meeting, allowing the owners to enter first. Right as every last one fit inside, Fisher shut the door. Newly installed automatic locks sealed the doors and windows. The tra was sprung. As the owners stared around in confusion, smoke flooded through the vents. Once the the mist vanished, only Garnett and World Peace stood in the room with the owners demanding to “settle this like men.” World Peace added: “yeah, or lions from the future.” Even Garnett gave Metta a glance after that one. "Agreed, contraction is not the answer, but the fact remains our current revenue dividing system cannot survive a long term... I'm sorry the what on my head? Oh a baseball. I'm wearing a baseball. It’s official: Ron Artest has signed with the Mon-Stars. The Lakers player signed a one year contract with the team paying him $800,000 space bucks with an opt out clause if the NBA lockout ends. 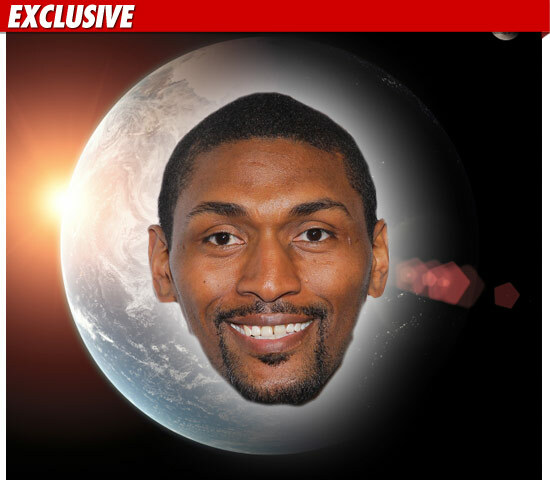 Artest, soon to be Metta World Peace, will report to camp in one week. The Mon-Stars expressed interest in Artest as early as May; however, the defensive-wunderkind was not sold. Many wondered if Artest would mesh with their mid-90’s style of play and racial hatred of all Toons. All agree this is great news for the Toon League, which has seen a stark drop in attendance since Bill Murray retired. Screw Jordan, let Artest play baseball! UPDATE: Lola Bunny will continue to coach the Toons from the sideline against Artest, her former fiance.